When it comes to paint colors and fabrics, choosing the most aesthetically pleasing decor is fairly simple. Southwestern decorating offers such a strong viewpoint that personalizing within the genre is a joy. However, picking the right hardwood floors can be more difficult. Before anything else, consider the color you prefer. In general, beautiful honey maples and oaks blend well with the colors found in a southwestern home. Both of these woods give off a beautiful glow in the sunlight, adding both warmth and depth to any room. Alternatively, a great backdrop for a southwestern styled home is extremely dark flooring, including ebony and mahogany. The glossy finish adds elegance by the ton, and is a slightly more modern twist on Native American and southwestern decor. Either way it is important to steer clear of cool colors in your new hardwood floors, especially woods like cherry that are better suited to a Victorian home or bungalow. Once you have selected the perfect color you next must choose plank width and length, and your preferred mode of installation. The rustic theme found especially in southwestern decor calls for wide luxuriously cut planks in order to maximize the natural grain in the wood. Make sure that you consider the scale of your room when choosing plank width. Too thin in a large room can be rather busy, but overly large in a small room with little light can make the home seem smaller. When it comes to length, if you prefer a more uniform look buy planks that are cut to predetermined lengths. Random planks add a cozy and sometimes slightly quirky personality to a home that can be very attractive to both guests and future buyers. While how much you love the flooring is important, it is also an important investment in your home. If neither uniform planks nor random planks seem quite special enough for your home, consider parquet flooring. While it can sometimes have the stigma of being dated, Native American and southwestern decor can pull it off beautifully due to the repeating patterns often found in textiles of the same nature. It is an unexpected way to add texture, as well as being monochromatic which leaves you with the option of interesting splashes of color elsewhere. 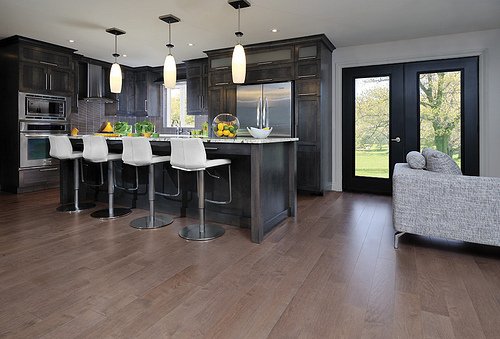 Hardwood floors are first and foremost an investment in your home, and choosing the product that fits in both with your needs and the tastes of future buyers is imperative. Be sure to purchase something high quality, and do not be afraid of adding personality and character to your home with unexpected colors and textures.